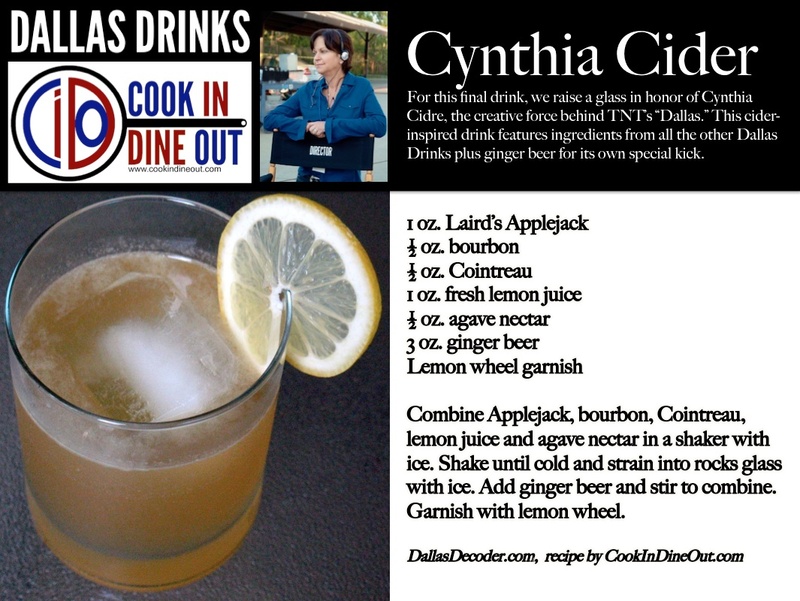 In advance of the TNT Dallas first season finale tomorrow, we conclude Dallas Drinks today with a toast to the series' developer, Executive Producer Cynthia Cidre. Given her name, this drink is inspired by apple cider, represented here by Laird's Applejack, an apple brandy blend. Ginger beer gives it a spicy kick. Additionally, the drink features ingredients from all the other Dallas Drinks: bourbon (John Ross, J.R., Bobby), lemon juice (Ann, Christopher, Sue Ellen), agave nectar (John Ross, Elena) and Cointreau (Ann, Rebecca). So clever! Thanks honey -- for all nine recipes and everything else.